It's been a while since I addressed the community and its direction - and with the Civil War coming to a close, a number of structural changes having been implemented, and a series of development now coming to maturity I feel these offer excellent opportunity to bring you all up to speed. As is readily becoming apparent, we are fast approaching the conclusion of the Civil War - the storyline that has driven SSTRP since the start of 2018 following the loss of Earth and our subsequent betrayal by Erin O'Brien and the Sanctuary faction. To recap: we started as one of 7 factions - the Sixth Fleet, the scorned Centaurans, the separatist Draconians, the business-obsessed Confederation, as well as the Federal Unionists and Sanctuary. We quickly grew through the month of January, taking up several new holdings, almost exclusively through the power of diplomacy. We forged several alliances - some held, some broke. We convinced Iskander, "the Breadbasket of the Federation" and a prior bastion of pro-Federation civic virtue to join us - eventually, Iskander would become our capital. We fought our first major foe - the Draconians - as January came to a close. The duplicitous separatists who had themselves arranged a non-aggression pact chose to perfidiously invade our western borders. The Sixth Fleet sent a fleet of their own to respond, culminating in our first overwhelming victory of the war - a victory so powerful it convinced our easterly neighbours who already shared many of our values to enter into a formal union with us - eventually supplying our leader, General Danny Martin. Much of February was spent planet hopping through Draconian space, slowly but surely conquering and absorbing their empire into our own, titling ourselves "the Coalition", in appreciation of the multiple separate but equal entities that made us up. By March, we were a force to be reckoned with, controlling much of the south, and with this we set our sights northwards: it was inevitable that Sanctuary would eventually attack us, and force our otherwise cordial northerly neighbours the Confederacy to fold in or face annihilation: from there, our strategic goal was to convince the Confederacy that we, not Sanctuary, were the future of the Federation - and more importantly, that we had a realistic chance of coming up as victor, especially as it became evident that the other unionist faction - the Federal Unionists - were not long for this world. The Unionists knowing the inevitability of their defeat eventually decided to throw in the towel - ceding their unholdable territory to Sanctuary, whilst pledging the remainder of their fleet to the Coalition in return for safe passage. They also gave us another little gem in the form of intelligence: several councilmen, the politicians who made up the former Federation's supreme lawmaking authority, were being held on a remote planet within Sanctuary space. The Ulysses S. Grant - as the fastest, smallest and hardest to detect ship within the Coalition (or indeed the entire Federation) was dispatched into enemy territory to reclaim them. And reclaim them we did - however, this came with its own unique set of challenges: we had just claimed one of Sanctuary's prize possessions, and they wanted them back. Sanctuary assembled a task force of warships to sweep west to east - with the goal of hunting down and tightening the noose around the Grant. We did however escape that fate - we raided several Sanctuary planets, forcing Sanctuary to send task force ships to respond, stretching them thin. We knocked out their local communications relay within the region, reducing their ability to communicate and respond. We exploited their disarray and snuck past their line, making our way westwards across the entirety of Sanctuary's domain. As we made our way westwards, we were tasked with a special mission: Sanctuary were developing some sort of weapon on Epsilon Prime; we were tasked with capturing or destroying it. We discovered there that Sanctuary were working on Progenitor beam tech under the watchful instruction of Dr Przemek Lubomierz - a renowned if eccentric Federation scientist. We abducted him (though he didn't seem to mind an awful lot), recruiting him to develop weapons for us instead - and within a month, he had delivered a prototype. We eventually made our way back to Coalition space, where once again we focused on establishing an alliance with the Confederates. We had made some progress - impressing them with our ability to strike Sanctuary, to reclaim the Federation councillors, and our flexibility in negotiations to give them a better deal than Sanctuary were willing to offer. A summit was scheduled to take place on Iskander - our capital - to further explore terms. But whilst there disaster struck: our arch-foe the Progenitors reared their ugly head, with the goal of taking Iskander. After a long, hard fought battle, however, Lubomierz's device was weaponised and aimed at the Progenitor ark - delivering a blow hard enough to convince the Progenitors to abandon their desires on Iskander. Our victory - the first outright win in a battle between Progenitors and Humankind - was enough to convince the Confederates to join our alliance against Sanctuary: where there was 7, there was now only 2. This position means that we are poised for the final phase of the war - two factions must enter the ring, but only one will leave. There are two potential outcomes for us: a win scenario, and a lose scenario. This depends on the performance of the Coalition leadership as well as the individual actions of MI on the ground. The conclusion will be a three day campaign - though not for Sanctuary itself (as I would struggle to find enough material to fill it) but for a planet critical to both sides' interests in a sort of Crossing of the Rhine moment. @Orwell and @F r a n c o have kindly helped me launch our final death spiral this week whilst I have been away with Sanctuary's decision to blitzkrieg the Coalition. This will take place some time in May. Following the conclusion of the Civil War, the newly reformed Federation will refocus its efforts on humanity's real enemy at this current time: the Progenitors. I have a series of events as well as a pair of campaigns planned that will progress the story line the Progenitor's own promised demise - likely to take place some time around September (their one year anniversary). After this, we will return to developing some of the more traditional facets of the SST universe. I don't intend on spoiling the surprise - but long story short, we've already lined up a third major plot to succeed the Progenitors. Whilst it's only been 6 months since SSTwoRP debuted, a number of faults and bugs have emerged and the original developer is unfortunately no longer in a position to help. A great shame - but there's no point crying over spilt milk. Many of you may have noticed @Gr4Ss's presence on server this past months: those of you who aren't aware, Gr4ss was a former SSTRPer from the better part of half a decade ago. In those five years since he has developed a reputation as a premier developer, especially within the Clockwork sphere where he is a strong contributor and a developer of the most popular plugins on the market. He has kindly agreed to work with us in order to develop a new schema tailored to modern day SSTRP - albeit with a few twists that should help us to push the server in a direction that is more rich, more complex, and where the your decisions and the decisions of the people around you are more consequential. We began closed testing amongst the admin team in March and are hoping to run a series of successive missions on the development server over April in order to properly put the script through its paces and to eliminate any bugs or causes of lag before we permanently go live with it. I've hinted at it repeatedly ingame - but another development that is just about to reach the end of the pipeline is the Morita Mk 3. Shortly before I wrote this post the developer who was tasked with animating this handed it off for me to test - meaning all that remains is to bind this to CW. Much like the Mk 1, there are several variants of/attachments for the new rifle - suppressors, scopes/ironsights, as well as ammunition types (including a high powered round that sacrifices great recoil in return for high damage - perfect for those with the DMR scope!) and etc. This will likely debut towards the end of the Civil War. To begin with it will be made available top down until eventually it will likely be offered as an option to PFCs and above. It is unlikely to fully supplant the Mk 1 however. Another thing in the works right now is the first major retrofit of our ship - the Ulysses S. Grant. The bottom half of the ship is being completely revamped for this task, with a new scoop-style hangar, a new half-deck in between Habitation and the Cargo Bay, as well as a new armoury and new brig. The central reservation will likely be overhauled to feature a proper freight elevator, and the cafeteria area will be populated with some new rooms to encourage roleplay - besides a couple of free rooms, I am thinking a tattoo parlour and a dentist. More maintenance areas will be added. This will take place after the end of the Civil War. @El Excellente is currently in the process of stripping and skinning a new tank entity over from Neurotec - these perform much better both in terms of lag and in terms of how they actually function ingame. It will also provide a good opportunity to put Neurotec to the test as this framework will also form the backbone of the later TACOPs gamemode. These should debut within the next month or thereabouts. Heavily WIP - but it will replace the Mk 2 as our SAW. 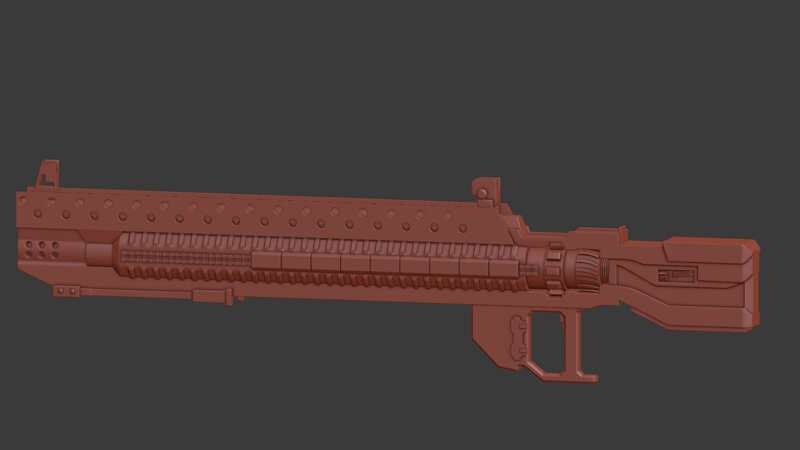 Bear in mind that it is completely untextured right now - the red is just a modellers aid. I will intentionally be keeping this bare metal - this will be pure ironsights, and there won't be a scope for it (even if there is one in the movie). In terms of their gameplay role, they should not be effective at range - that's the job of regular infantry with their versatile long rifles. As a result, I will intentionally be keeping these bare metal - meaning ironsights with no scope. 1. They often attract a type of player that are looking for an easy ride to power. These players then use their authority to interfere in the discipline of the MI as if they were legitimate Sergeants or NCOs. The history of the marines is littered with examples of this: I've personally killed three marine Specialists for challenging and trying to confront Larsen - a General. 2. They have no valid reliable role in the field: guarding HVTs is a rarity (<1 a month), and the plan to have them exclusively handle breaching actions detracts from the MI and is therefore a detriment to the server. 3. For them to perform these roles exclusively it would mean they'd need to be in-game 24/7 - which means they need high recruitment. But high recruitment for a division that does so little so rarely is a recipe for failure. If there are no marines on, would that mean we can't breach buildings (and therefore not deploy at all)? Of course not - the MI would do it. Which leads me on to my final point: everything they can do could and often is done by a regular infantry sergeant rounding up a posse. In their place, an as of yet unnamed investigative/prosecutor division made up of Military Intelligence Lieutenants will replace them. I'm tapping @El Excellente to manage FFRL as he already manages the wiki - and FFRL as a division are designed to enhance our canon (through the wiki). // what would happen to marine chars rn? Transferred to MI, discharged, etc? Transferred to MI as Pfc. if your char was not told anything else. Things have happened OOCly that have put this timeline on hold for a while. Please keep watch on the forums for updates regarding the Civil War and the war against the Progenitors.